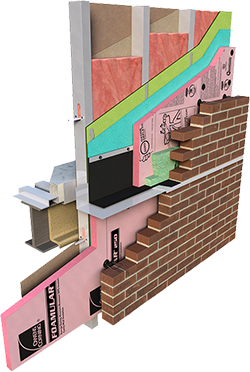 Owens Corning FOAMULAR 250 Extruded Polystyrene (XPS) Rigid Foam Insulation is a closed cell, moisture-resistant rigid foam board well suited to meet the needs for a wide variety of residential and commercial construction applications. FOAMULAR® 150 and 250 are also available in scored square edge (SSE) configuration, scored at 16" and 24" centers. FOAMULAR 250 Extruded Polystyrene (XPS) provides continuous insulation over steel stud framing. FOAMULAR 250 Extruded Polystyrene (XPS) provides continuous insulation in insulated concrete sandwich panel walls, in masonry unit cavity walls, or when used with non-penetrating, surface mounted furring systems over masonry or concrete walls. FOAMULAR 250 retards the transmission of water vapor and moisture in masonry walls.